If you descended the stairs to the WCS Archives on a Wednesday over the last four months, you might have seen tables and holding shelves set up in the outer room, and boxes, storage tubes, building plans, artwork, and large documents (and lots of interleaving tissue) everywhere–along with two unfamiliar but friendly faces! 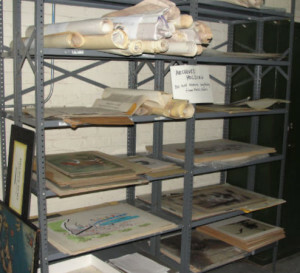 As part of the WCS Archives’ ongoing preservation plan for its collections, a Preservation Assistance Grant was requested and received from the National Endowment for the Humanities to purchase storage furniture and supplies to rehouse special format items (including oversize items such as maps, plans, and artwork, as well as scrapbooks and photo albums). Some of these items had unfortunately been stored in less-than-ideal conditions in the past and were in strong need of preservation attention. 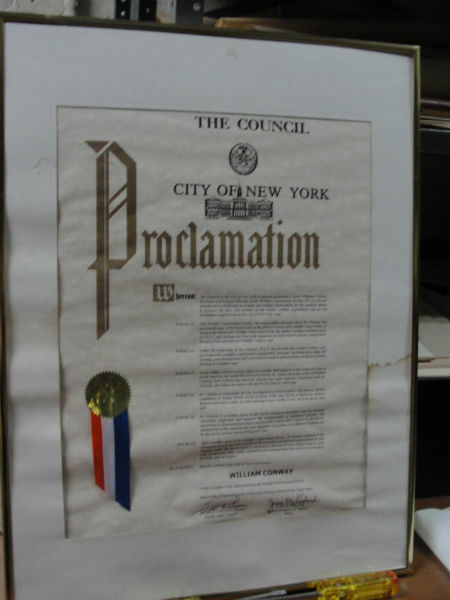 Additionally, the WCS Archives was very pleased to receive funding from the Lucius Littauer Foundation to bring in a preservation consultant and intern to assist with the project. Subsequently, consultant Beth Patkus and intern Marina Rosenfeld began the 5-month grant project at the beginning of September 2013. 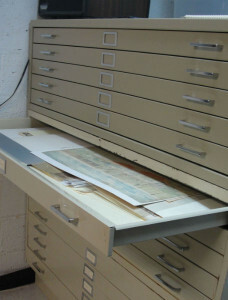 The first order of business was to begin sorting through piles of unorganized oversize flat items and to purchase another map case so that crowding in the existing map case drawers could be alleviated. Old map case folders also needed replacement. Beth calculated how many oversize folders and boxes would be needed, while Marina measured old scrapbook boxes so they could be replaced with new preservation-quality boxes. 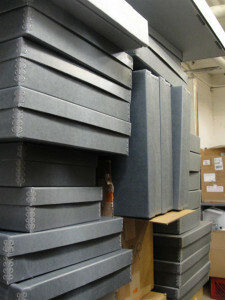 Once the orders came in, we had a lot of boxes! Many fascinating and beautiful items that had been previously unfamiliar to WCS Archives staff were discovered as part of the sorting process, including original artwork created for New York Zoological Society (later WCS) projects and publications. Some of these items illustrate the various preservation challenges encountered during the project. 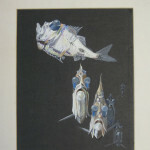 Among them are illustrations of fish observed by Dr. William Beebe during his dives in the Bathysphere off the coast of Bermuda in the early 1930s. These were apparently part of a larger exhibit honoring Beebe after his death, and were mounted on exhibit board which has become acidic over the years. 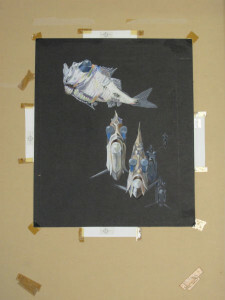 Some of the illustrations were taped or glued to the board, however, and will require removal by a trained conservator. Until they can be treated by a conservator, the items were interleaved with acid-free tissue, foldered, and boxed. 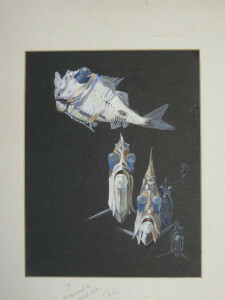 Matted illustration of deep-water fish done for the Department of Tropical Research during the 1930s. Notice the deterioration and staining of the adhesive tape used to fasten the item to the board. Other items showed evidence of water damage that had occurred sometime in the past. 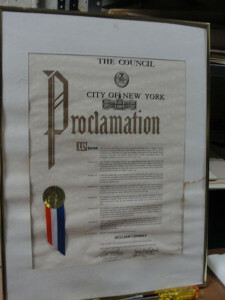 The proclamation pictured here shows staining and cockling (waviness) from exposure to water. Unfortunately once this damage has happened it is very difficult to restore the item. In addition, sometimes when an item has been exposed to water, “tide lines” will be evident, where dirt or other soluble material has been deposited at the “edge” of the water-damaged area. 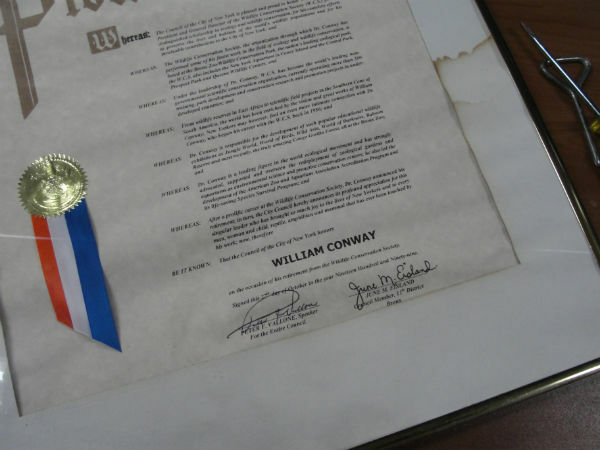 This item was removed from its frame, foldered, and boxed with other similar items. A number of early drawings relating to Bronx Zoo exhibits and buildings were also found. The drawing below dates from the late 1890s and is signed “WTH,” William T. Hornaday, the first director of the Bronx Zoo. 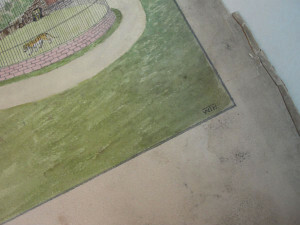 It depicts a building for lions and tigers (the Zoo’s own Lion House opened in 1903), and also shows evidence of dirt and possibly some mold from poor storage conditions at an earlier time. 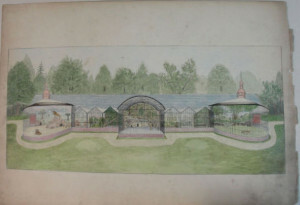 As with other damaged items, this drawing was foldered, interleaved with acid-free tissue, and housed in the map case with similar-sized items. It is certainly a candidate for treatment by a conservator. The project to preserve WCS’s rich collection of special format items is continuing, and future blog posts will share more of what has been found! This blog post was written by Beth Patkus and describes the WCS Archives’ 2013-2014 Special Formats Preservation Project, funded by the National Endowment for the Humanities and the Lucius Littauer Foundation.